Plain wedding bands and rings for men and women were once the standard choice, eventually giving way to more elaborate and ornate rings. But, like all things, plain wedding bands have been making a comeback, being recognized for their sophisticated and elegant simplicity in bother design and fashion. The understated elegance, simple craft, budget friendly pricing and ability to recycle old jewelry to create new symbols of your love are all reasons couples find this option attractive. If you are in the market for wedding rings and have found plain rings to be attractive, there are several options, designers and grades of quality that you need to be familiar with when shopping for such an important purchase. Exploring all your options before purchasing is really the best way to begin looking for wedding rings, and guarantees that you will find just the ring you are looking for. Why Choose Plain Wedding Bands? With all the options that are available these days, and the ability to custom design your own bands, being able to find just about anything your imagination can conjure up, many people would wonder why you would even choose plain wedding bands. Surprisingly, most couples that decide on a plain set of rings, do so for the same reasons couples end up choosing more elaborate and ornate rings. Plain wedding bands are considered elegant, sophisticated and a timeless classic by many. Available in any type of metal, most of the sizing and design issues that buyers have to deal with as bands get more intricate are a non issue with plain bands. Additionally, even though the bands are essentially plain, there are still different ways to customize the rings and design so that the rings take on the exact look that you want. In the end though, most couples settle on plain rings because it takes their commitment back to where all the focus should be, on them, and off the material items that are used to symbolize their union, but do not need to be extravagant. Aside from the more conventional reasons for choosing plain wedding bands, there are several couples that might decide on this design for financial and socially or environmentally conscious reasons. The lack of settings, stones and intricate designs brings down the cost of these types of bands considerably, making bands made from even the most expensive metal choices, affordable. More socially conscious shoppers who are concerned about where their jewelry comes from and its impact on the environment or the local economy where metal and gemstones are mined. Just because you have decided on a set of simple wedding bands, this does not mean that there are no options to choose from to make your rings special. Like other sets of rings, you still need to decide on the type of metal that you want your rings to be made out of, the size or width of the rings, whether you want a polished look to the metal and if there will be any personal engravings on the inside. Each of these options makes your ring unique and special for you and your spouse. Initially, the cost of plain wedding rings can, and should be, relatively low, especially when compared to more elaborate ring sets. When shopping around for your ring, it is important to watch for price gouging so that you are only paying for the rings that you are purchasing and not the name or an inflated price that is added simply because they are meant to be wedding rings. The price range that is associated with plain wedding rings will only differ depending on the type and karat metal that you choose, with minimal fees being added for the quick customization options you choose. In general though, you can expect some basic price ranges for plain wedding bands. Quality yellow gold rings for both men and women have a base price of eighty to two hundred dollars. White gold is a little costlier, beginning at one hundred dollars and hitting up to three hundred dollars depending on how wide the bands are. Platinum and titanium wedding bands that have a plain style and are devoid of any stones or designs are a lot more affordable than the same band that is covered in diamonds. You can expect platinum rings to begin at around two hundred dollars and run up to four hundred dollars, and titanium to begin at three hundred and run up to five hundred dollars. The only way the price range for these types of wedding bands would go up is if you add a bunch of additional options. Fortunately, there is not room for many additions because the idea is to keep the rings simple and basic overall. You can expect custom engraving on the inside of the bands, and an increase in width to drive the price range up anywhere from one to two hundred dollars. Overall though, even with the different options available to you, plain wedding rings will end up costing you a small fraction of the price for other rings. Because they are not seen as often as the more ornate products, and possibly because they do not bring in as much of a profit as the more elaborate ones, most couples are confused about where plain wedding rings can be found. Many times, the same jewelers that carry other wedding bands already carry plain styles, or they can custom make them easily because they do not have a lot of intricate work to them. There are a lot of online jewelers and e-stores that carry plain wedding rings or can order them to size. Shopping online for plain wedding bands also gives you the chance to compare designs, styles and prices– which is a lot harder to do in person from store to store. Most large jewelry chains carry an in house standard wedding ring that is plain in design, but there are also some well known jewelry brands design plain bands as well. 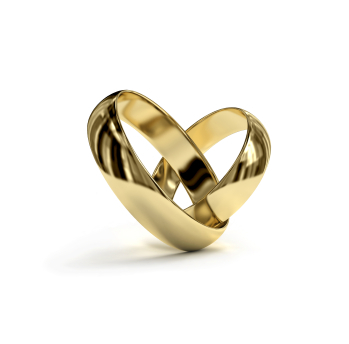 Some of the popular chains that offer this type of jewelry for couples are Kay Jewelry, Jared’s and Zale’s. Brand name jewelery brands also create these plain wedding bands and they include Verragio, Donna Karan, and Coach. Shopping around for your wedding bands is the only way to guarantee that you are getting the best price. When you know how much something costs and what you can get for your money, you are better able to select the perfect ring and know a quality piece when you see one. Remember, price does not always indicate quality, so informing yourself is your insurance against price gouging. Already, you can expect to get a good deal for plain rings because they do not follow style trends and stay the same year round. This also means that rarely will these styles of rings be marked down because their popularity does not decrease or increase with time. With classics like this, they best way to ensure that you will not be paying for additional changes is to make sure you have your ring finger sized by a professional instead of doing this yourself. Most jewelers will size your ring finger regardless of purchases made, because you will need to know your ring size when shopping.